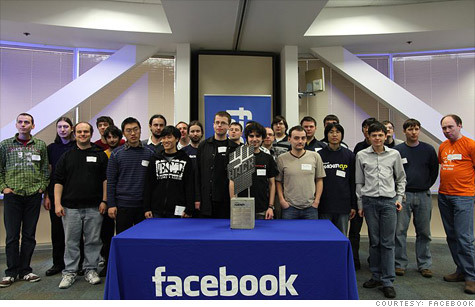 Facebook's first Hacker Cup, held in March, drew 25 finalists from 10 countries. NEW YORK (CNNMoney) -- Think your programming skills are world class? Facebook wants you to prove it at its second annual Hacker Cup challenge. "Hacking is core to how we build at Facebook," the company said in a blog post announcing this year's competition. "Whether we're building a prototype for a major product like Timeline at a Hackathon, creating a smarter search algorithm, or tearing down walls at our new headquarters, we're always hacking to find better ways to solve problems." Open to coders anywhere in the world, Facebook's competition pits participants against each other in five rounds of programming challenges. The first kicks off January 20 with a 72-hour qualification round. Three more online rounds will thin the field down to the final 25 competitors, who will be flown out to Facebook's Menlo Park, Calif., headquarters for a final competition in March. Tech companies have an ulterior motive for running hacking contest: They're a great way to find skilled programmers, one of the industry's scarcest resources. Google runs an annual Code Jam contest, which Mitrichev won in 2006. Facebook prides itself on its hacker culture, and dangles coding puzzles on its recruiting page with the slogan: "Solve programming challenges. Get a phone interview." The company frequently holds marathon staff hackathons as part of its product-development process. Facebook also likes to crowdsource its site hacking. In August, the social network launched a "bug bounty" security initiative, inviting security researchers to send details of any Facebook vulnerabilities they uncover. Facebook offers up a finder's fee of at least $500 to those who find security holes. Tech companies desperate for "rockstarninja engineers"